During a working visit to the capital of Tatarstan, President Dmitry Medvedev had a good time tasting local cuisine, forging souvenirs and dancing at a rock concert. Medvedev traveled to Kazan on Saturday to hold a joint meeting of the Presidential Council on Development of Physical Culture and Sports and the Fund for Support of Olympians in Russia. Before the meeting, Medvedev took part in festivities for the traditional Tatar holiday Sabantui. Sabantui is a holiday that marks end of spring field work, and is celebrated annually in Tatarstan. "This is one of the most prominent festivals in the country," Medvedev declared from the main stage of the Sabantui festival. The Russian president and the head of Tatarstan visited local farms, where Medvedev was presented with the traditional crafts of various Russian peoples. At a Tatar house, Medvedev tried on the national hat and skullcap, and was served various dishes from the local cuisine. He tasted Kazi, a dried sausage made from horse meat, and the world-famous sweet dish Chak-Chak. At a Russian farm he got familiar with the traditions of Russian blacksmiths and helped forge a horseshoe, which was presented to him as a souvenir that brings luck. 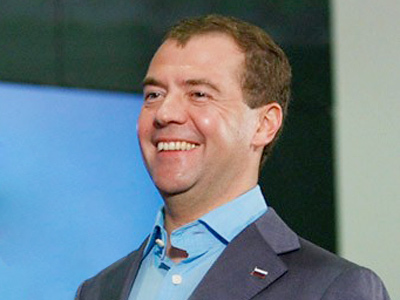 Medvedev also visited an international rock festival along the walls of Kazan’s Kremlin, along with thousands of spectators.